As parents age, it’s nice to have them close by. Often times, this means moving them directly into your home so they can “age in place”, or live where they wish as long as they can as they age. But with that transition comes the need for change — a change in your home design that is. Parents who choose aging in place usually desire to retain as much independence as possible, and with some adjustments to your home, they can. As you plan, remember that as your parents age, their needs for various services may change. You’ll want your design to accommodate their changing needs over time. Planning ahead makes for an easy transition. It will help you stay ahead of the biggest problems that homeowners face during a renovation, and will make the process run more smoothly. You can also avoid the headache of moving your parents in and then undergoing the renovation process. Consider where your parents will reside. Will they have their own space with a kitchen and living area? Will they simply have a private bedroom and bathroom? Plan where their designated space will be, and follow with the remodel. Whether you are building an addition or designing a home remodel for your aging parents, keep their wants in mind. Give them a space with design elements that will make them feel at home, such as trim you know they will love and wall paint they will enjoy. But make the space as functional as possible by adding a few adjustments. Single floor living is the best solution for your home remodel for aging parents. Stairs can be hazardous. So when creating an in-law suit, keep in mind that every aspect of your parents’ space — bedroom, bathroom, kitchen, and living space — should be contained to one floor. If your parents will be utilizing your kitchen and living spaces, keep their in-law suite situated on the first floor. It’s also important to have at least one home entry point with no steps. Open concept means fewer barriers for your aging parents. 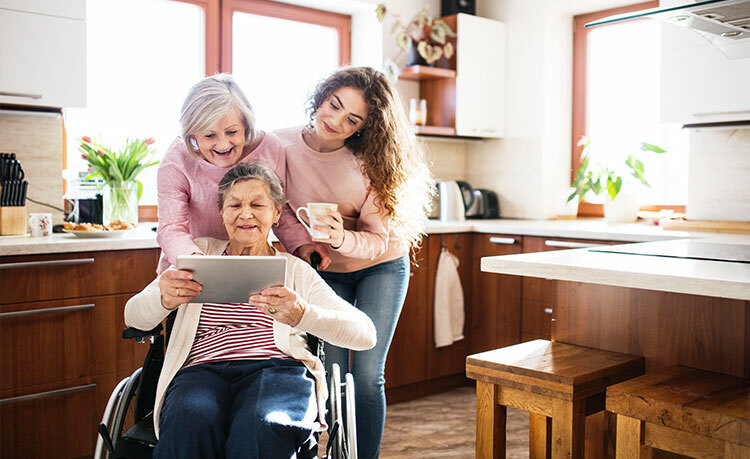 If their mobility is not a present issue, creating an open floor plan is still a good idea to help prepare for any needs that may arise in the future. Widening doorways and hallways allows for easier mobility and can help parents in wheelchairs or with medical devices to move about the home freely. You could also consider installing pocket doors so that swing space doesn’t become an issue. Pocket doors are especially helpful in bathroom areas where spaces can be compact. The use of a kitchen is paramount. When designing a kitchen remodel, consider installing pull down shelves in the cabinets to help everyone have access to even top shelf items. Incorporate D shaped handles on cabinets and doors, as people of every capability level can use them. You should also consider the height of countertops and outlets, making them easily accessible for everyone in your home. Think about installing an anti-scald device on your sink to protect from overheated water. Bathrooms can be some of the most hazardous spaces in a home due to slippery, wet floors. They are also points of high traffic and use. Installing a walk-in tub or shower with a shower seat (whether built in or not) allows an ease of use for your parents or in-laws. Consider mounting grab bars throughout the space — in the shower and near the toilet to assist with sitting and standing. You can also install non-slip tile for added foot grip. Once you know what your changes will entail, you can begin planning the financial portion of your remodel. Finances can seem complicated when it comes to home remodels or additions, but there are many options available for financing. You may be planning to use the money from the sale of your parents’ property to finance the project, or you might be considering a loan. Check out our guide on finding the best financing option for your home addition or remodel. If you have a contractor to work with, ask them for a quote, or begin looking for a qualified contractor for your project. You should know what to anticipate for your budget. As a Pittsburgh home additions contractor, we’ve designed and constructed numerous in-law suits and home remodels for aging parents. See our remodeling services to see how we can help you start planning. Schedule a free consultation with us to get design ideas best suited for your family and home.